Increase your tree and landscape knowledge! 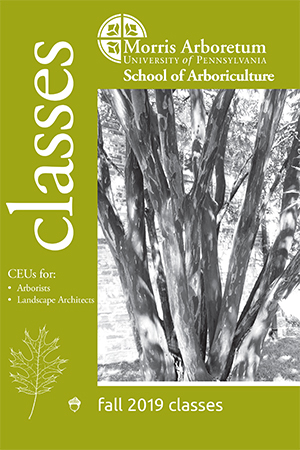 The Arboretum's Professional Courses, offer CEUs for arborists and landscape architects, and keep you at the forefront of your profession. These courses are open to professionals and novices, and are all taught by national leaders in their field of expertise. CLICK HERE for the Spring 2019 course catalog. This class provides an introduction to tree climbing and features the opportunity to have supervised climbing instruction in trees. It is ideal for tree companies looking to advance promising grounds staff, or for gardeners and landscapers who want to add new skills. Effective methods for climbing trees will be demonstrated by instructors and practiced by students. Safety rules will be reviewed and stressed. Students will learn how to tie critical knots regularly used by arborists. Included in the fee, each student will receive a copy of The Tree Climbers Companion by Jeff Jepson, a great resource for climbers. If you have them, bring an arborist’s rope and saddle, a hard hat, gloves, safety glasses to the class. If not, there is equipment you may use. Wear boots, long pants, and dress for the weather. This class meets at the Arboretum’s Bloomfield Farm Horticulture Center. Lunch is included with registration fee. This course is designed for people who want to become Pennsylvania Certified Pesticide Applicators. It is the core, introductory portion, of the certification training and must be taken before any category certifications. The course provides an introduction to the proper use and mixing of pesticides, reading and understanding labels, equipment maintenance and calibration, and record keeping, as well as an overview of Pennsylvania’s rules and regulations regarding pesticide use. Clark has been training applicators for many years through his company, Focus on Training, and previously worked as an utility/power line arborist. Lunch is included with registration fee. This course carries 6.5 CEUs for ISA certified arborists (S=2, P=3, M=1.5) and pesticide update credits (core) from the Pennsylvania Department of Agriculture. *Note: The Pesticide Applicator Certification Exam will not be offered at the conclusion of this course. Test dates and locations can be accessed through the Pennsylvania Department of Agriculture website at https://paplants.state.pa.us/Index.aspx. This class will discuss identification of diseases, insects, and other ornamental pests through the use of signs and symptoms. We will discuss using integrated pest management to control pests on ornamental plants. This includes control methods and pesticide products. We will also consider ornamental plant applications and will review everything from equipment and techniques, to some of the unique concerns involved when doing foliar pesticide applications. Lunch is included with registration fee. This course carries 6.5 CEUs for ISA certified arborists (S=2, P=3, M=1.5) and pesticide update credits from the Pennsylvania Department of Agriculture.